EOG Resources sees the Bakken as a high rate of return growth play, and plans on drilling 80-net wells in 2014. That's nearly double the number of net-wells drilled in 2013, which was 54. At that rate, the company has a drilling inventory in the Bakken of ~8 years. 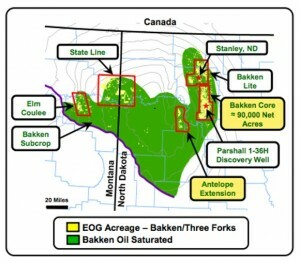 EOG Resource's focus area will be in its Bakken core acreage (~90,000 net acres) and the Antelope Extension area. Based on successful drilling results in the Three Forks formation in the Antelope Extension in 2013, EOG plans on testing additional benches during 2014. Completion and cost improvements in the play have resulted in EOG deciding to direct more of its capital budget to the Bakken. In 2013, EOG ramped up its drilling plan from one to four wells per section, while increasing the average recoverable resource per well. More downspacing is expected in 2014.